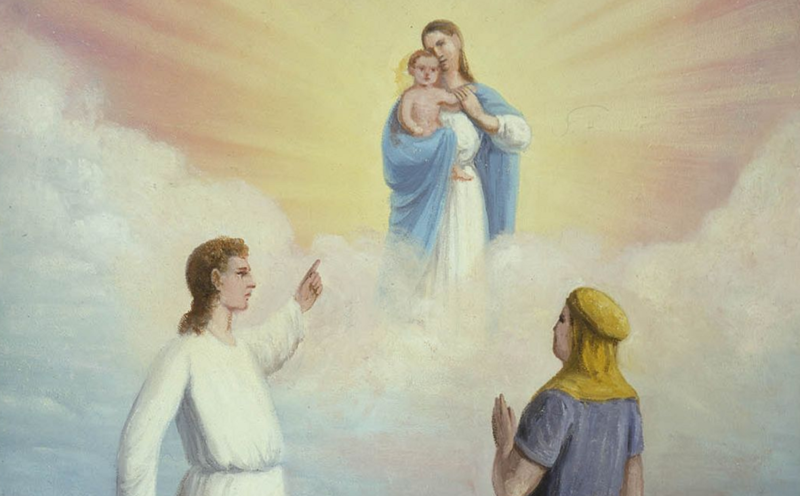 "Nephi’s Vision of the Virgin and the Son of God" by C. C. A. Christensen, via history.lds.org. 1. For recent explorations into Lehi’s and Nephi’s visions, see Daniel L. Belnap, Gaye Strathearn and Stanley A. Johnson, eds., The Things Which My Father Saw: Approaches to Lehi’s Dream and Nephi’s Vision (Salt Lake City and Provo, UT: Deseret Book and Religious Studies Center, Brigham Young University, 2011). 2. This imagery and language is unmistakably reminiscent of Moses’ visionary encounters with Jehovah found in the book of Exodus: “And the Lord spake unto Moses face to face, as a man speaketh unto his friend” (Exodus 33:11). 4. As summarized in Robert L. Millet, “Another Testament of Jesus Christ,” in First Nephi, The Doctrinal Foundation, Book of Mormon Symposium Series, Volume 2, ed. Monte S. Nyman and Charles D. Tate Jr. (Provo, UT: Religious Studies Center, Brigham Young University, 1988), 165–167. 5. See Book of Mormon Central, “What Vision Guides Nephi’s Choice of Isaiah Chapters?” KnoWhy 38 (February 22, 2016). 6. See Book of Mormon Central, “Why Don’t We Know the Names of the Angels in the Book of Mormon?” KnoWhy 426 (April 19, 2018). 7. In some biblical passages (e.g. Genesis 16:7–14; Exodus 3:2–4) the “angel of the Lord” is probably Jehovah himself. This raises the possibility that Nephi was greeted by the Holy Ghost as well as the pre-mortal Jesus in his vision. 8. See Jared M. Halverson, “Lehi’s Dream and Nephi’s Vision as Apocalyptic Literature,” in The Things Which My Father Saw, 53–69. 9. See further Zechariah 1–6 and Ezekiel 40–48. 10. See Benjamin E. Reynolds and Loren T. Stuckenbruck, eds., The Jewish Apocalyptic Tradition and the Shaping of the New Testament (Minneapolis, MN: Fortress Press, 2017). 11. See David P. Melvin, The Interpreting Angel Motif in Prophetic and Apocalyptic Literature (Minneapolis, MN: Fortress Press, 2013). 13. For commentary, see Peter R. Carrell, Jesus and the Angels: Angelology and the Christology of the Apocalypse of John, Society for New Testament Studies 95 (Cambridge: Cambridge University Press, 1997). 14. See 1 Enoch 17–22; Apocalypse of Abraham 9–32. These and other non-biblical apocalyptic texts are available in translation with commentary in James H. Charlesworth, ed., The Old Testament Pseudepigrapha, Volume 1: Apocalyptic Literatures and Testaments (New York, NY: Doubleday, 1983). For additional commentary on these two texts, see Collins, The Apocalyptic Imagination, 55–59, 225–232. 16. See Brent E. McNeely, “The Book of Mormon and the Heavenly Book Motif,” in Reexploring the Book of Mormon: A Decade of New Research, ed. John W. Welch (Provo, UT: FARMS, 1992), 26–28; Terryl L. Givens, “The Book of Mormon and Dialogic Revelation,” Journal of Book of Mormon Studies 10, no. 2 (2001): 16–27, 69–70; David E. Bokovoy, “‘Thou Knowest That I Believe’: Invoking The Spirit of the Lord as Council Witness in 1 Nephi 11,” Interpreter: A Journal of Mormon Scripture 1 (2012): 1–23. 17. The apocalyptic genre received its final and thereby fullest articulation in the post-Exilic period of Israelite history (the mid-6th century BC onward), well after the departure of Lehi and his family from Jerusalem. However, the roots of the genre, including many of its underlying elements, date back to at least 600 BC and potentially much earlier. See the references collected and discussed in Robert F. Smith, “Poesey and Prosody in the Book of Mormon,” in “To Seek the Law of the Lord”: Essays in Honor of John W. Welch, ed. Paul Y. Hoskisson and Daniel C. Peterson (Orem, UT: The Interpreter Foundation, 2017), 452­–454. See also Collins, The Apocalyptic Imagination, 17–42. 18. See Halverson, “Lehi’s Dream and Nephi’s Vision as Apocalyptic Literature,” 64–65, quote at 65. 19. Boyd K. Packer, “Lehi’s Dream and You,” in Brigham Young University 2006–2007 Speeches (Provo, UT: Brigham Young University), 258.